I hope, dear reader, that you will indulge me a moment whilst I slip in to the third person to set the scene, it will only happen this once, I promise. We last left our intrepid travelers feeling a little overawed by things in Dijon. I am happy to report that, as predicted, things are much happier and upbeat in the ‘TrektoOz’ camp after an active stay in the Alps and a peaceful few days in Tuscany. During the early hours of Monday, our last night in Dijon, Megan witnessed the most torrential down pour, coupled with some very impressive thunder and lighting. I say Megan witnessed it, as I slept though it all after drinking the majority of the wine that evening. It did mean however that we had to pack up a wet tent in the morning, always a joy. We also noticed that the clothing locker leaked, our bedding box on the roof leaked, the kitchen leaked, and the cooker filled up with water, but to be fair this was only because we left it out. Luckily I had packed a tube of silicone and a pleasant hour was spent filling gaps and getting silicone all over my clothes. We left Dijon early on Monday morning for the 4 hour drive to the Alps and after the flat, rather boring countryside of the drive through France so far this stretch of road was amazing. The last hour approaching Chamonix was particularly beautiful. We stayed at a campsite we had stayed at before and it’s definitely on my list of top 5 campsites of all time. 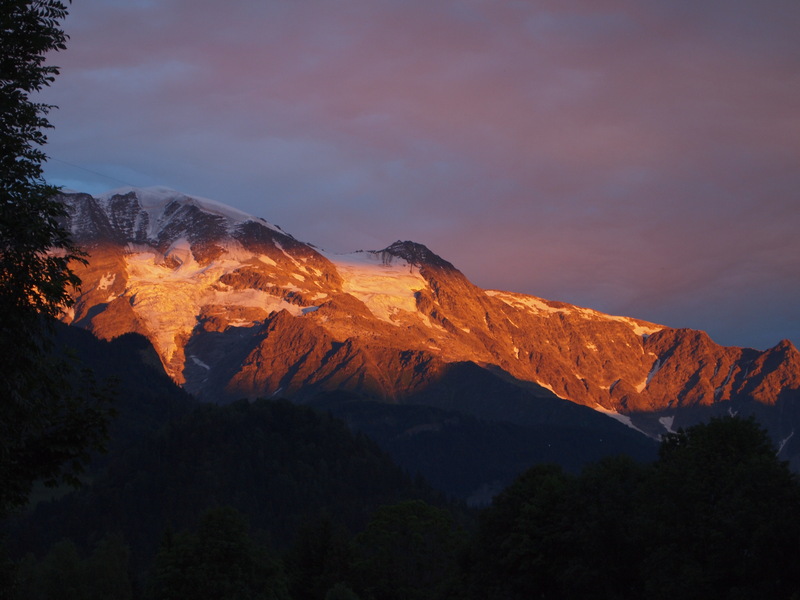 Waking up and seeing Mont Blanc first thing in the morning is quite fantastic. We did a little sight seeing and visited a village called Megeve, which is one of the most beautiful in France and has achieved a 5 flower rating (which I’m informed is the highest) for its floral displays. St Gervias, where we were staying, only has a 4 flower rating, I guess they just didn’t want it as much. Megeve was also the scene for one of my all time hilarious comments. Megan was commenting on the fact that the horses pulling buggies for the tourists around town had different coloured hair on their heads compared to the rest of their body, and I explained that this is because they use ‘Just for Manes’! Comedy gold. We got a cable car up a mountain and walked back down, which doesn’t sound that impressive but when you ignore all the signs, paths and directions, turning what should have been a 40 minute walk into 2 hours believe me, it was. i particulary enjoyed this entry. Keeping up to date with your adventures (jealously!) and glad you are enjoying it. Good stuff guys .. the guy who runs the campsite in St Gervais is a lovely fella … he gave us a map of the local green lanes which we took our jeep and my mates Landy around .. truly breathtaking green lanes. You think you’re doing an awesome piece of green laning, and then you meet a normal 2wd Fiat Panda coming the other way and you realise its everyday life for these guys. Keep the blog coming .. its inspiring us all (well .. me and Mrs B) to travel!